After a hard day saving mushroom kingdoms, stomping on enemies or acquiring new powerups from bosses to destroy a demented Doctor, what better way of relaxing then with a nice game of pool. Set in the the future. Isn’t that every person’s dream? 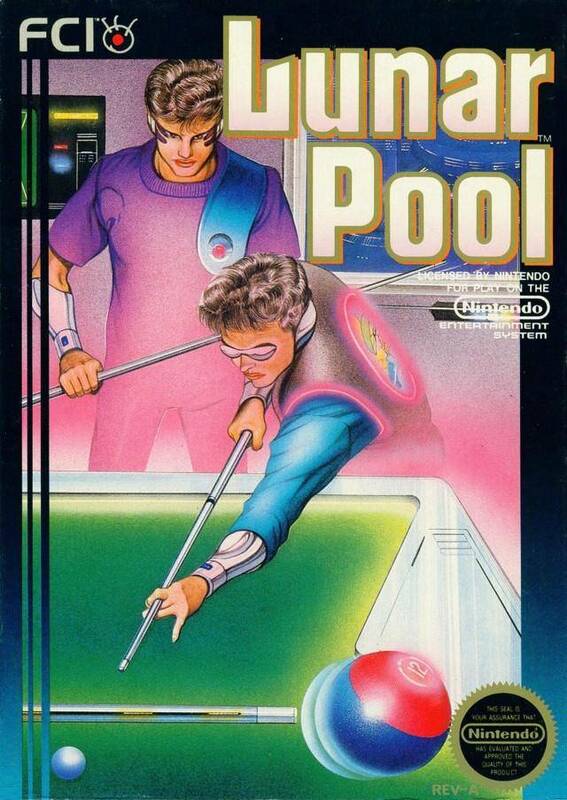 Well dream no further as the game developer’s Compile knew what we we’re all thinking and what we wanted, and created a pool game set in the future with futuristic tables and the ability to control gravity. So grab your moon boots, your futuristic cue and hustle like its 2099 as we head into the realms of Lunar Pool. 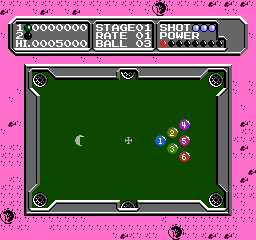 Lunar Pool as the name suggests is a pool game set in the realms of outer space. If the rules of pool defy you then it may be worth checking out Wikipedia but in a potted condensed version, you pot the balls into the pocket and….that’s it. Pool games are simplistic in themselves but the twist is the theme of the game with which the clue is in the title. With the ability to control the amount of friction that the balls travel round the table on, and the weird and wonderful table designs, it certainly makes for a more unusual pool game. With Lunar Pool as the player if you fail to pocket a ball in three consecutive shots, or if the cue ball is pocketed then you lose a life. With only a certain amount of lives you need to have the eye of the tiger and ensure your accuracy is up to speed. If the game is played against another player or the computer, players take turns shooting the cue ball but if one player fails to knock at least one of the balls into a pocket, or pocket your own cue ball, then it will be the opponent’s turn, so bear that in mind players. So when you power the game up, you get the option of playing one player (against no opposition), two players in a local co-operative game or intriguingly a Vs Comp mode, which is not as exciting as it sounds but is you versus the computer. So regardless of whether you want to play with yourself (no sniggering at the back), with a real life friend or a computer friend, there is something for everyone in Lunar Pool. So as well as choosing what game mode you play, you also get to choose which round you start at, with up to 60 tables to choose from although the numbers won’t mean much unless you remember that table number x relates to a certain design. 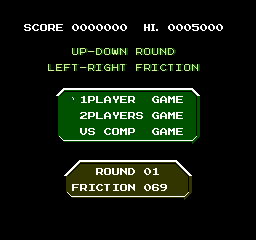 You also get to choose the friction of which the balls travel round the table at, starting at 0 which feels like you’re playing pool in mud, to 255 which is like playing pool on ice. So depending on the friction, you may need to change strategy in order to win. The colours for the game are bold and defined, though the pockets do look like sink holes. 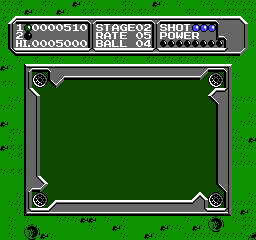 However, as the graphics are well defined and colourful, for a pool game it certainly is a treat for the eyes. The controls are about as simple as they can get for a pool game, with the left/right d pad moving the cross-hair which would indicate which direction the cue ball will travel in. Moving the up/down d pad supposedly controls another part of the cross-hair however having compared when the cross-hair is near and when the cross-hair is far, it doesn’t seem to affect the trajectory or spin of the ball. So as of yet the result of the up/down d pad is unknown. 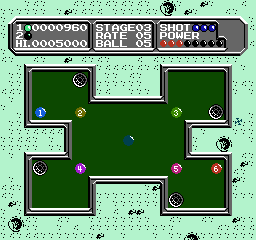 The A button launches your ball into the other balls, like a supersonic comet smashing into the planets knocking them out of alignment. The game has basic jaunty music and sound effects which to be fair belong to the Atari 2600 but pool isn’t the most audio-friendly of games, it may be worth putting on your mini-disc and listening to the latest Beastie Boys record, or whatever the youth listen to these days.